Avoid computer vision syndrome – tired eyes. My eyes get a lot of screen time. I read newspapers and magazines online to save paper. A Sharp Eye means a lot of time in front of computer screens looking for ideas that will interest you. I have noticed a deluge of offers for computer glasses which claim to be healthy for those of us who are tied to the screens on our tablets, computers and phones and a little television. Even the Peloton bike adds screen time. Experts describe ‘computer vision syndrome’ symptoms as dry, tired eyes that feel like they have sand in them. People get headaches which they ascribe to screen time and their eyes don’t focus well. This makes sense because when looking at a screen, people focus at the same distance for long periods and may not blink as often as they need to. The bright blue light and reflected glare off the screen put strain on your eyes. Here are some tips on how to keep your eyes healthy without giving up your screens. 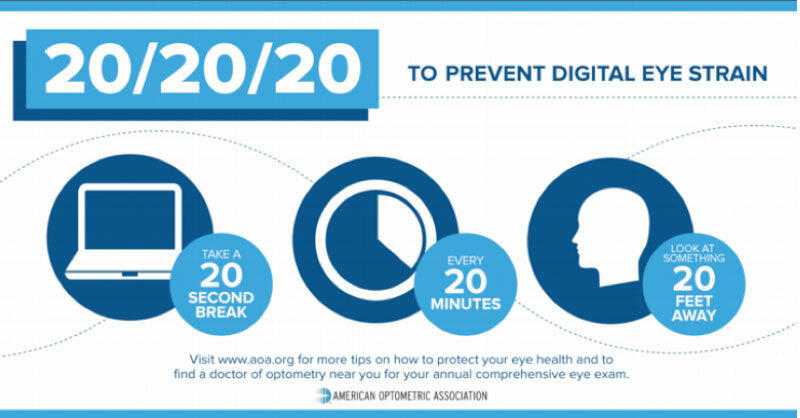 20-20-20 – To avoid staring at a single distance while you concentrate on a screen, look at a point 20 feet away for 20 seconds every 20 minutes. It is also healthy to stand up and stretch while you look up. Choose glasses with an anti-glare coating. Felix Gray offers glasses made specifically to protect your eyes from glare and blue light from screens. 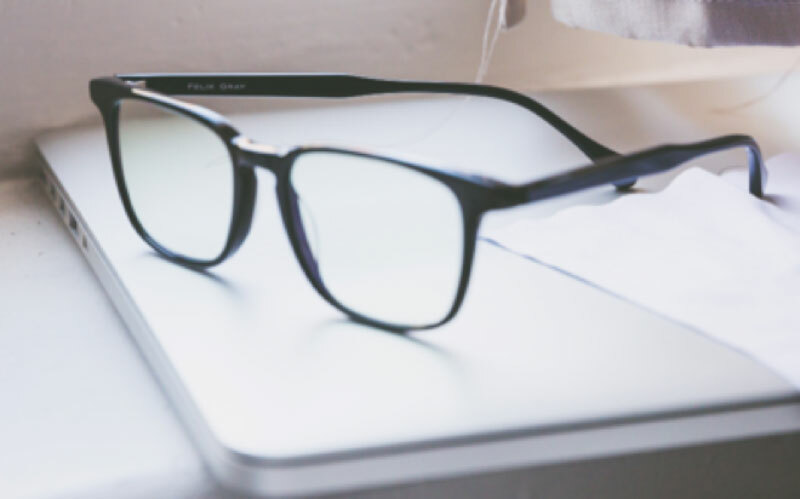 The experts seem to agree that while there is no scientific proof, people often report their eyes feeling better when they use glasses like these. Available in prescription and non-prescription lenses. There are several styles with a guide to help you fit the lens width, bridge width and arm length. Beginning at $95.00. Privé Revaux claims to have anti-blue light technology in their lenses to protect your eyes. Beginning at $29.95. Typical eyeglass prescriptions assume that you read 14 to 16 inches from your eyes. Most people sit more like 20-24 inches from their computer screen. You will need a different prescription or strength in your reading glasses. Should we worry about the bright blue light emitted from our screens? We hear a lot about blue light from our screens and its tendency to keep us awake. I can’t find conclusive medical reports, but the logic is that our body’s circadian rhythms are tied to the cycles of the sun. As the sun goes down, our retinas get less light, our hypothalamus calls for our body to produce melatonin and other hormones. We wind down and fall asleep. Modern man keeps bright lights on well into the evening and we hover over screens with the bright blue light emitted by LEDs – and our bodies do not get the ‘wind down’ message. It is recommended that we avoid bright screens for 2-3 hours before bedtime and opt for reddish, dim lights at night. Computer makers and software designers are helping us avoid blue light at night by offering new apps. Windows Night Light. Go to ‘settings’ and search for ‘Night Light’ and move the onscreen toggle to on. Apple Night Shift. Go to the ‘Control Center’, click on ‘brightness control’ and tap to turn ‘Night Shift’ on. f.lux is a program which makes to color of your computer screen adapt to your needs throughout the day. Will eating carrots keep your eyes healthy? Scientists suggest that best nutrition for our eyes are the antioxidants found in kale, collard greens and spinach. Why don’t they find these positive health benefits in chocolate or chardonnay?! The following is a report on the connection between nutrition and the eye’s ability to withstand damage from blue light. “Although the ocular benefits of lutein and zeaxanthin on MPOD have been known for some time, these new findings add to researchers’ understanding of how supplementation can affect physical indicators of excessive screen time usage, such as eye strain, fatigue, headaches and even sleep quality. The Age-Related Eye Disease Study (AREDS) and AREDS 2 determined nutrition could play a significant role in eye health, and concluded that lutein and zeaxanthin had a role in protecting against high-energy blue and ultraviolet (UV) light.